Giving My Wife a Bath: Demo Day! Removing the existing flooring was just as easy, albeit slightly more messy. Why the previous owners decided to lay such a cheap and ugly product over the original hardwood floors is beyond me; but, to each his own. Anyways, a little prying with the crowbar and some muscle was all that was needed. 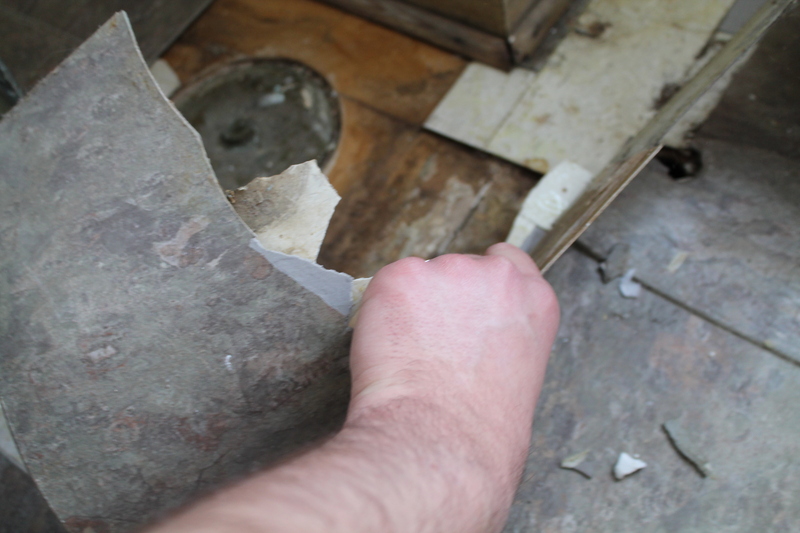 If a floor covering comes off that easily, it should have never been installed! 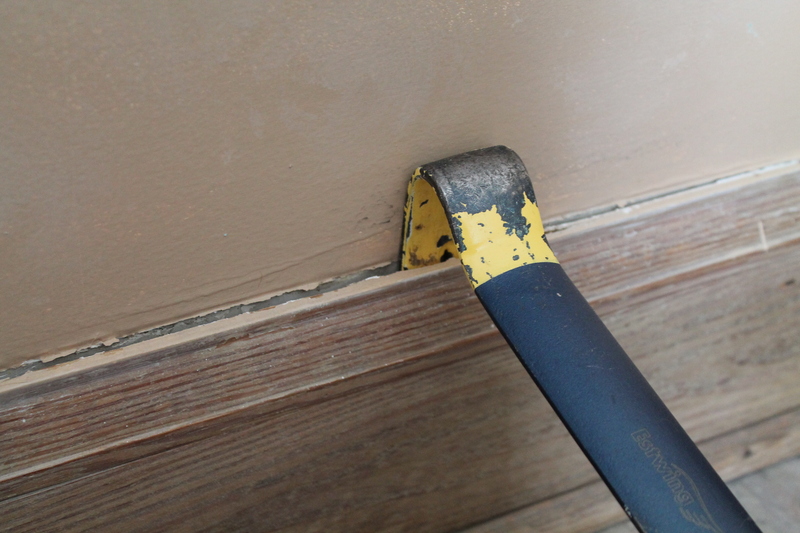 Oh, and it was a sticky job…lots of glue under there! I felt like I was walking through a mousetrap! The next step was to disconnect the massive cast iron tub, which probably weighs a little over 150 pounds and is effectively the centerpiece of the renovation. Not knowing how such tubs are made, I was a little nervous as to how we’d get it out of the room, but my father quickly realized that the feet of the tub could easily be removed so that the unit can fit through the door. Loosen the screw and they slide right off! Once we got the tub out of the bathroom, we inspected it for cracks and quickly noticed the manufacturer’s imprint on the bottom. 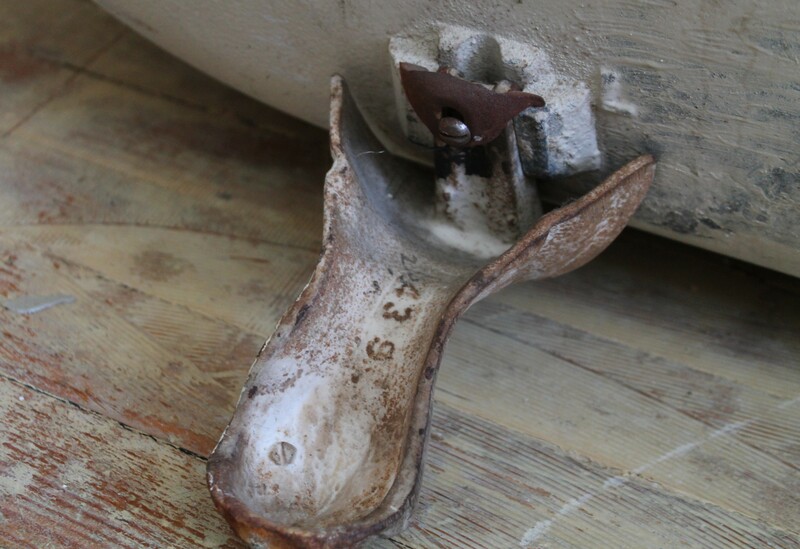 As it turns out, the tub was manufactured in 1931 by the Standard Sanitary Manufacturing Company based out of Pittsburgh, PA. Pretty cool! Many times, I prefer old things to new. I appreciate the character, the history and the vintage aesthetic. This made my decision to keep the tub (and buy a house build in 1932) much easier. That said, I am a little creeped out by the fact that we’ll be taking baths in a tub that has been used by countless other couples over the last 83 years! Anyways…the wainscosting is the next step. Until then, be sure to check us out on Pinterest and Instagram! Can’t wait to see the rest! I love old homes as well and love when people restore them to their former glory!